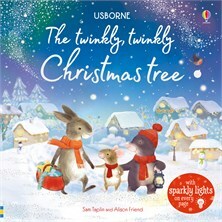 Children – and adults – will love the twinkly lights that light up as you turn the pages and follow the story in this book. Mouse has no Christmas lights, so she sets out with her friend Mole and together they discover the twinkliest Christmas tree sparkling with lights. A beautiful gift and a delightful book to share during the festive season.